The morning after I land in Bangalore, I go for a walk in my neighbourhood. My parents live in a residential area in the old part of town, and their apartment faces a small but busy road. Next to the apartment complex is a general-store, and a colourful STD-ISD booth stands out in one corner. Outside the store a man is sitting on a stool with his sewing machine, adding a few stitches to what looks like a salwar while two young girls stand next to him, waiting. When he finishes, one of them gives him a five-rupee note and collects the dress. The tailor pockets the note, shifts his position a little, and looks around to see if the next customer is approaching. The smallness of that transaction – five rupees – makes me wonder how many such clients he gets each day. Five, on a good day? And how much would he earn each day, on the average? Surely not more than thirty rupees. That makes it around nine hundred a month, if he worked every day. How many mouths did he have to feed? And what if he had a loan on the sewing machine? I walk further, crossing people on their way to work early morning. Most are from the lower middle-class – the kind who commute using local buses, work in small offices or shops and earn not more than a few thousand rupees a month. 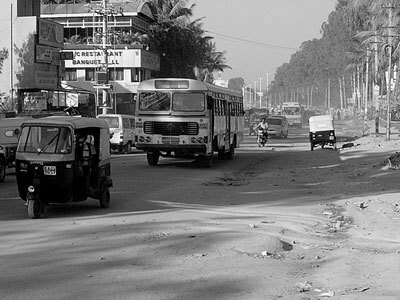 The vehicles on the road are mostly bicycles, two-wheelers and auto rickshaws; occasionally, an old Maruti 800 or an Ambassador passes by. There is the sabji-wallah with his assortment of vegetables clinging precariously to baskets tied all around his bicycle; there is the paper-wallah, also on the bicycle with his load of newspapers, who stops at every gate and throws the morning edition over it; there is the doodh-wallah, returning after his morning round of milk-delivery, with large, empty aluminium cans that make a klang each time his bicycle goes over a bump or into a pothole. The scene brings me back to reality. The image of Bangalore I have been carrying is restricted to IT parks swarming with software engineers who drive in their newly acquired Ford or Honda and who visit, after work or on weekends, the shopping districts and spend their wealth on designer labels and international brands and, through their spending, create the consumer society that generates more wealth for people in different layers of the economic continuum that spans an urban population. This image, as I see it now, is a very limited one. It is not that I expected most of the city to be transformed; a better explanation is that my focus on a small section of the upper middle-class made me forget the others who occupy most of the city. And what I now see in this scene also indicates that change in India is slow, which, among other reasons, is due to the large number of people involved. The road slopes down a little, and soon I am at an intersection where a few autos stand in line. Across the road, in a small vacant plot of land, there is a tent with a tarpaulin exterior. A little away from the tent I see a woman squatting on the ground stirring a pot balanced on a few thin logs of wood. A trail of smoke lifts from the fire beneath the pot into the woman’s face, and she uses the end of her saree to wipe away her smoke-induced tears while continuing to stir the pot with her other hand. At a corner of the plot, next to a gutter that runs along the road, two small boys in their underwear are cleaning their teeth with fingers. They take turns to spit into the gutter and to rinse their mouth using the glass of water they are sharing. There is no sign of the father; he is either asleep inside the tent, or is away looking for a suitable spot to answer nature’s call. I stand there for a while looking at this family preparing for yet another day; slowly my thoughts turn philosophical (as they usually do when I’m confronted with images of stark poverty). It seems plainly unfair that someone like me has a life of luxury while others like them receive such a raw deal. I turn this thought over a few times, and finding no immediate resolution, I continue walking. Some weeks later I watch Swades. In the movie, a Non-Resident Indian (NRI) visiting India has a similar experience when he encounters the depth of poverty in rural India. He then goes on to empower a village with power-generating capability through a scheme that harnesses electricity from a tiny waterfall. At the end of the movie he is back in India for good, with the intention of helping the poor. I know I cannot follow the NRI’s footsteps; I console myself that such responses are limited to the celluloid. But my own responses have been unsteady and inconsistent. I remember the night in college many years ago when I read about the reaction of a nineteenth-century tribal who comes to a city and is shocked by the disparity between rich and the poor, between those who move about in elegant horse-driven carriages and those who sit begging. 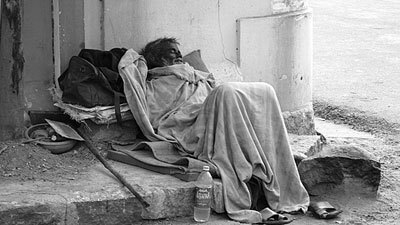 He asks his friend – a city dweller – how people in the city could live like this, without caring for “one of their own kind”. For the tribal, his tribe is his family, and he cannot imagine not taking care of one of them. In the city each one is a stranger, isolated from the rest. I remember that that innocent remark by the tribal had kept me awake for half the night, a night when I repeatedly asked myself how we had let humanity reach a state of such callousness. Something must be done about it, I told myself that night. And then, as life in college wore on, the message of this episode slowly faded into obscurity. On one of my last days at Bangalore, I am reminded of a conversation I had with a German colleague some years ago. After looking at some impressive pictures of our Bangalore office, and he asked me how we felt when we went out from such a plush workplace into a city that had so many poor people on the road. I thought for a while and replied that I had never looked at things that way, and perhaps living in such surroundings over a long period had numbed my senses to an extent I no longer noticed them. The surrounding poverty was part of our landscape, integral to it and one that gave it an identity. It needed a foreigner’s eye to notice the contrast, and it was they who pondered over this duality that was common in cities of developing nations. I am walking in my neighbourhood as I think about this conversation. It is four weeks since I arrived in Bangalore, and when I look around people in the street appear normal: they do not stand out in my line of vision. I have crossed a while ago the intersection where that tent stood, and I do not remember giving it a glance or sparing a few thoughts. It is now yet another memory, like the tribal I had read about long ago. It’s lovely to see you here Parmanu. I remember this post, and I agree: it’s one of your greatest hits, full of the wonder and close-observation I love about your writing. A familiar truth. Thank you. Teju, I learned about qarrtsiluni through your site – thanks a lot for that!